Reading and share top 120 famous quotes and sayings about Rule Of Law by famous authors and people. Browse top 120 famous quotes and sayings about Rule Of Law by most favorite authors. 1. "Expedience, not justice, is the rule of contemporary American law." 2. "For all the tough talk about China during the presidential debates, Romney and Obama evaded any mention of China's suspect human rights record, corruption, and rule of law. By not tackling these controversial topics, the candidates are protecting a strategic partnership with China at the expense of essential human values and beliefs." 3. "Just as I know the usual rules of law enforcement, I also know the exceptions and invoke those frequently. I don't feel a need to bog the reader down with an explanation of why the procedures are realistic, as long as I know that there is, in fact, an explanation." 4. "I don't think the law exists to arrive at the truth. If it did, we wouldn't have exclusionary rules, we wouldn't have presumptions of innocence, we wouldn't have proof beyond reasonable doubt. There's an enormous difference between the role of truth in law and the role of truth in science. In law, truth is one among many goals." 5. "There's no way to rule innocent men. The only power any government has is the power to crack down on criminals. Well, when there aren't enough criminals, one makes them. One declares so many things to be a crime that it becomes impossible for me to live without breaking laws. Who wants a nation of law-abiding citizens? What's there in that for anyone? But just pass the kind of laws that can neither be observed or enforced nor objectively interpreted - and you create a nation of law-breakers - and then you cash in on guilt." 6. "The study of law can be disappointing at times, a matter of applying narrow rules and arcane procedure to an uncooperative reality; a sort of glorified accounting that serves to regulate the affairs of those who have power--and that all too often seeks to explain, to those who do not, the ultimate wisdom and justness of their condition.But that's not all the law is. The law is also memory; the law also records a long-running conversation, a nation arguing with its conscience." 8. "I also need you to "spread the word," quietly, that if any harm should come to Antanasia during my imprisonment, I will not only tear down these walls stone by stone, but -- once freed -- shatter the rule of law and destroy, with great satisfaction, anyone who arouses in me even the slightest suspicion. Indeed, if so much as one hair on my wife's head is disturbed while I cannot protect her, this kingdom will see retribution that will go down in the history books -- to be read by the very few who remain standing. - Lucius"
9. "The bedrock of our democracy is the rule of law and that means we have to have an independent judiciary, judges who can make decisions independent of the political winds that are blowing." 10. "For there is but one essential justice which cements society, and one law which establishes this justice. This law is right reason, which is the true rule of all commandments and prohibitions. Whoever neglects this law, whether written or unwritten, is necessarily unjust and wicked." 11. "Redemption and relationship come before rules to help express thankfulness. Anglican pastor and Old Testament scholar Christopher Wright put it like this: The law was given to people whom God had already redeemed. . . . Grace comes before the law. There are eighteen chapters of salvation before we get to Sinai and the Ten Commandments. . . . I stress this because the idea that . . . in the OT salvation was by obeying the law, whereas in the NT it is by grace, is a terrible distortion of Scripture.10"
12. "I now want to examine a second major feature of Western civilization that derives from Christianity. This is what philosopher Charles Taylor calls the 'affirmation of ordinary life.' It is the simple idea that ordinary people are fallible, and yet these fallible people matter. In this view, society should organize itself in order to meet their everyday concerns, which are elevated into a kind of spiritual framework. The nuclear family, the idea of limited government, the Western concept of the rule of law, and our culture's high emphasis on the relief of suffering all derive from this basic Christian understanding of the dignity of fallible human beings." 13. "Now to consult the rules of composition before making a picture is a little like consulting the law of gravitation before going for a walk. Such rules and laws are deduced from the accomplished fact; they are the products of reflection." 14. "We all would like to see a brighter future for Haiti, and I hope this conference will serve to explore many views. Respect for human rights, freedom, and the rule of law must be established in the poorest nation in our hemisphere." 15. "Why did she want to stay in England? Because the history she was interested in had happened here, and buried deep beneath her analytical mind was a tumbled heap of Englishness in all its glory, or kings and queens, of Runnymede and Shakespeare's London, of hansom cabs and Sherlock Holmes and Watson rattling off into the fog with cries of 'The game's afoot,' of civil wars bestrewing the green land with blood, of spinning jennies and spotted pigs and Churchill and his country standing small and alone against the might of Nazi Germany. It was a mystery to her how this benighted land had produced so many great men and women, and ruled a quarter of the world and spread its language and law and democracy across the planet." 16. "For years many in the oil-rich states argued that their enormous wealth would bring modernizations. They pointed to the impressive appetites of Saudis and Kuwaitis for things Western, from McDonald's hamburgers to Rolex watches to Cadillac limousines. but importing Western good is easy; importing the inner stuffing of modern society - a free market, political parties, accountability, the rule of law - is difficult and even dangerous for the ruling elites"
17. "I detest audiences - not in their individual components, but en masse I detest audiences. I think they're a force of evil. It seems to me rule of mob law." 18. "From 1960-2015 Nigerians live under the rules of those who are above the law, but from 2015 we hope for a little change, and if there is no change in 2015, only God knows what will happened." 19. "However much the theory of political realism may have been misunderstood and misinterpreted, there is no gainsaying its distinctive intellectual and moral attitude to matters political.Intellectually, the political realist maintains the autonomy of the political sphere, as the economist, the lawyer, the moralist maintain theirs. He thinks in terms of interest defined as power, as the economist thinks in terms of interest defined as wealth; the lawyer, of the conformity of action with legal rules; the moralist, of the conformity of action with moral principles. The economist asks: "How does this policy affect the wealth of society, or a segment of it?" The lawyer asks: "Is this policy in accord with the rules of law?" The moralist asks: "Is this policy in accord with moral principles?" And the political realist asks: "How does this policy affect the power of the nation?" 20. "I know not how the Christians order their own lives, but I know that where their religion begins, Roman rule ends, Rome itself ends, our mode of life ends, the distinction between conquered and conqueror, between rich and poor, lord and slave, ends, government ends, Caesar ends, law and all the order of the world ends; and in place of these appears Christ, with a certain mercy not existent hitherto, and kindness, as opposed to human and our Roman instincts. (Quo Vadis)"
21. "Civil disobedience, as I put it to the audience, was not the problem, despite the warnings of some that it threatened social stability, that it led to anarchy. The greatest danger, I argued, was civil obedience, the submission of individual conscience to governmental authority. Such obedience led to the horrors we saw in totalitarian states, and in liberal states it led to the public's acceptance of war whenever the so-called democratic government decided on it...In such a world, the rule of law maintains things as they are. Therefore, to begin the process of change, to stop a war, to establish justice, it may be necessary to break the law, to commit acts of civil disobedience, as Southern black did, as antiwar protesters did." 22. "China recognizes and also respects the universality of human rights. We will continue our efforts to promote democracy and the rule of law." 23. "The political restructuring we pursue in China is aimed at advancing the self-improvement and development of the socialist political system. We will continue to expand people's democracy and build a socialist country under the rule of law in keeping with China's national conditions." 24. "A ruler who discerning justice refuseth to it the sanction of law, demanding abnegation of rights and self-sacrifice, will not drive his subjects to these virtues, virtuous only if free, but by unnaturally making justice unlawful, will drive them rather to rebellion against all law." 25. "The vision that the founding fathers had of rule of law and equality before the law and no one above the law, that is a very viable vision, but instead of that, we have quasi mob rule." 26. "A country's adhering to the rule of law does not mean that its citizens will not do bad things." 27. "People are, well, only human. We know that. The rule of law is borne out in identifying, condemning, and punishing those who violate the standards on which we all agree. This is exactly what we do in America." 28. "I hope the story of 2011 is that America gets its mojo back. You've got to remember that America has the best universities; it's got some of the best businesses. It's got an unbelievable work ethic, rule of law. The story of 2011 will be America blossoming again." 29. "Great countries need to secure their border for national security purposes, for economic purposes and for rule of law purposes." 30. "If Waterboarding is okay, then why don't we let our police do it to criminals so they can find out what they know? Because it's against the law. If we're not going to be a country that stand's for the rule of law, when it's convenient or inconvenient, then what DO we stand for." 31. "By their actions, the Founding Fathers made clear that their primary concern was religious freedom, not the advancement of a state religion. Individuals, not the government, would define religious faith and practice in the United States. Thus the Founders ensured that in no official sense would America be a Christian Republic. Ten years after the Constitutional Convention ended its work, the country assured the world that the United States was a secular state, and that its negotiations would adhere to the rule of law, not the dictates of the Christian faith. The assurances were contained in the Treaty of Tripoli of 1797 and were intended to allay the fears of the Muslim state by insisting that religion would not govern how the treaty was interpreted and enforced. John Adams and the Senate made clear that the pact was between two sovereign states, not between two religious powers." 32. "When we uphold the rule of law, our counterterrorism tools are more likely to withstand the scrutiny of our courts, our allies, and the American people. And when we uphold the rule of law it provides a powerful alternative to the twisted worldview offered by al-Qa'ida." 33. "President Ronald Reagan used to speak of the Soviet constitution, and he noted that it purported to grant wonderful rights of all sorts to people. But those rights were empty promises, because that system did not have an independent judiciary to uphold the rule of law and enforce those rights." 34. "True freedom requires the rule of law and justice, and a judicial system in which the rights of some are not secured by the denial of rights to others." 35. 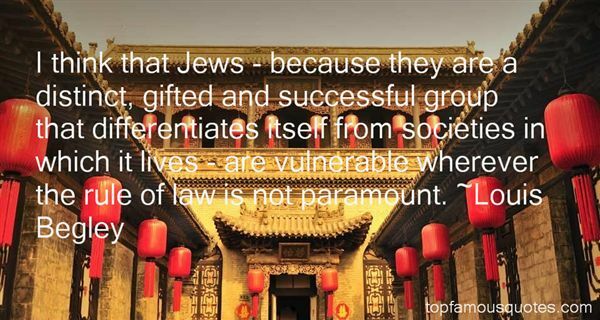 "I think that Jews - because they are a distinct, gifted and successful group that differentiates itself from societies in which it lives - are vulnerable wherever the rule of law is not paramount." 36. "The Chinese have certain advantages. The fact that it's a single party government. But I do believe in the long run the fact that India is a functioning democracy committed to the rule of law. Our system is slow to move but I'm confident that once decisions are taken they are going to be far more durable." 37. "The search for liberty is simply part of the greater search for a world where respect for the rule of law and human rights is universal—a world free of dictators, terrorists, warmongers and fanatics, where men and women of all nationalities, races, traditions and creeds can coexist in the culture of freedom, where borders give way to bridges that people cross to reach their goals limited only by free will and respect for one another's rights. It is a search to which I've dedicated my writing, and so many have taken notice. But is it not a search to which we should all devote our very lives? The answer is clear when we see what is at stake"
38. "The rule of law bakes no bread, it is unable to distribute loaves or fishes (it has none), and it cannot protect itself against external assault, but it remains the most civilized and least burdensome conception of a state yet to be devised." 39. "Good people will outlast the rule of the Church. No rule of law lasts for long, and there is nothing that can wholly destroy the good and evil that lives in man. It's ours to own for the duration of time and whatever exists beyond." 40. "A resilient people cherishing liberty and equality and the rule of law will endure." 41. "Liberalism is a creation of the seventeenth century, fathered by British philosopher John Locke (1632–1704). For Locke, liberalism means limited government, the rule of law, due process, liberty, freedom of religion, freedom of speech, freedom of the press, freedom of assembly, separation of church and state, and separation of government powers into branches that oversee each other's authority." 42. "Fear is the State's psychological weapon of choice to frighten citizens into sacrificing their basic freedoms and rule-of-law protections in exchange for the security promised by their all-powerful government." 43. "Freedom prospers when religion is vibrant and the rule of law under God is acknowledged." 44. "Arizona has become a national leader in the restoration of the Rule of Law, with over 100,000 illegal aliens having left the state since 2007." 45. "I have to give moral support to my supporters. If I'm not going to fight anymore, that might hurt the feelings of my supporters. They are fighting for democracy. They are fighting for the rule of law." 46. "Ever since his first ecstasy or vision of Christminster and its possibilities, Jude had meditated much and curiously on the probable sort of process that was involved in turning the expressions of one language into those of another. He concluded that a grammar of the required tongue would contain, primarily, a rule, prescription, or clue of the nature of a secret cipher, which, once known, would enable him, by merely applying it, to change at will all words of his own speech into those of the foreign one. His childish idea was, in fact, a pushing to the extremity of mathematical precision what is everywhere known as Grimm's Law—an aggrandizement of rough rules to ideal completeness. Thus he assumed that the words of the required language were always to be found somewhere latent in the words of the given language by those who had the art to uncover them, such art being furnished by the books aforesaid." 47. 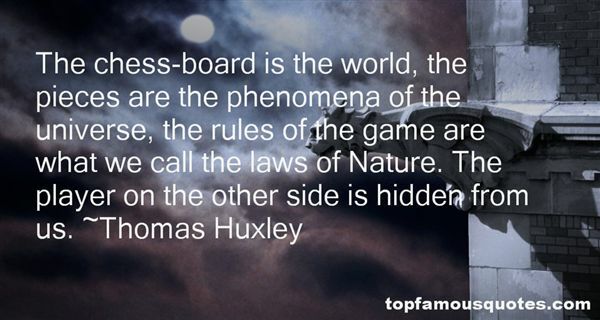 "The chess-board is the world, the pieces are the phenomena of the universe, the rules of the game are what we call the laws of Nature. The player on the other side is hidden from us." 48. "If all of us work in accordance with rule of law, if rule of law is implemented, we are all safe, investors are safe, people will be safe." 49. "Eisenhower has been much criticized for his failure publicly to endorse the Court's decision. But he felt that doing so would set an undesirable precedent. If a president endorsed decisions he agreed with, might he feel compelled to oppose decisions he did not agree with? 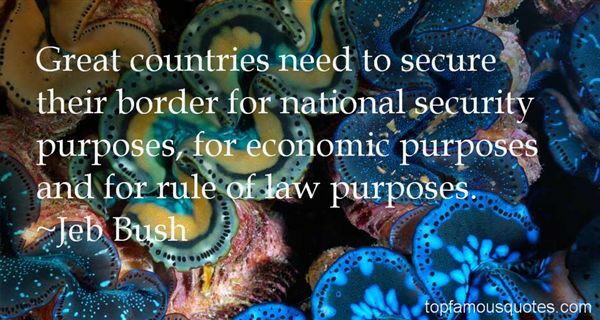 And what would that do to the rule of law? "The Supreme Court has spoken and I am sworn to uphold ... the constitutional processes.... I will obey. "3"
50. "Once you have hierarchy you need rules to protect and administer it, and then you need law and the enforcement of the rules, and you end up with some kind of chain of command or system of order that destroys relationship rather than promotes it. Hierarchy imposes laws and rules and you end up missing the wonder of relationship that we intended for you." The chilling thought occurred to me that breaking up with someone you love to criticize might be the only way to save yourself from becoming unlovable"